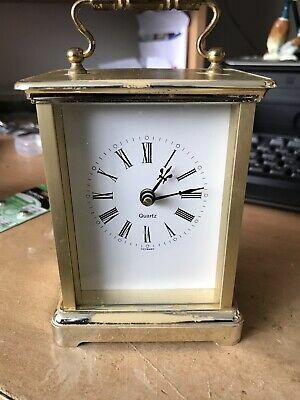 Seller: rummy947 (2,880) 99.6%, Location: Poulton-le-Fylde, Ships to: GB & many other countries, Item: 352638540639 Carriage Clock (Made In Germany).Working Order.Signs Of Wear - Hence Price.. Dispatched with Royal Mail 2nd Class. Popularity - 102 views, 6.0 views per day, 17 days on eBay. Very high amount of views. 1 sold, 0 available. Good amount of bids. 102 views, 6.0 views per day, 17 days on eBay. Very high amount of views. 1 sold, 0 available. Good amount of bids. Seller - 2,880+ items sold. 0.4% negative feedback. Great seller with very good positive feedback and over 50 ratings. 2,880+ items sold. 0.4% negative feedback. Great seller with very good positive feedback and over 50 ratings.